With the deadline of April 30 approaching fast to work out the modalities after the WTO ministerial meet at Hong Kong, the chances of a fair deal to the satisfaction of developing countries, including India, this year are looking increasingly slim. The people of Kolkata and neighbouring two 24-parganas districts exercised their franchise at the state's third phase of polling today, under the supervision of the Central observers and paramilitary forces, which was a new experience for many voters. 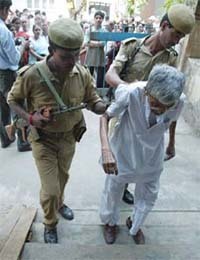 Paramilitary personnel help an elderly voter at a polling station in Kolkata on Thursday. After the withdrawal of four candidates, 16 candidates now remain in the election battle in the high-profile Rae Bareli parliamentary byelection scheduled for May 8. The four Independent candidates who withdrew their nominations are — Mohd Najim of Inquilab Party of India, Surendra Kumar, Hori Lal and Vasudev. Amethi MP Rahul Gandhi yesterday hinted at being agreeable to taking over the reins of the state Congress for the forthcoming assembly elections if leaders in his party requested him. The Bihar Congress yesterday welcomed the desire expressed by Mr Rahul Gandhi to lead the party from the front in the Assembly poll in Uttar Pradesh slated for next year. In a move to drive maximum political mileage, the BJP today said it was against the dilution of constitutional provisions on the office of profit issue and charged the UPA with not disclosing its tentative views on the issue. BJP has retained the Patna West Assembly seat for which the byelection was held on Monday. BJP’s candidate Nitin Navin, supported by JD(U), won by a margin of over 70,000 votes, defeating Congress candidate Ajay Kumar Singh who was backed by the RJD and CPM. Charging the Congress-led UDF government with attempting to “hide the truth” in the 2003 Marad massacre in Kerala, the BJP yesterday demanded a CBI inquiry immediately into the violence in which nine Hindu fishermen were killed. Prime Minister Manmohan Singh has waded into a maze of controversies on return from his foreign trip. Faced with rising anger against Human Resource Development Minister Arjun Singh’s proposal to provide quota for OBCs in Central universities and IITs and IIMs, the Prime Minister has also to contend with his ministerial colleagues openly differing on the issue. As the revived Parliament of Nepal meets tomorrow, CPM leader Sitaram Yechury, who has been mediating between the seven party alliance and Maoists, would visit the Himalayan Kingdom as part of his efforts towards finding a way to usher in democracy. The Centre today sanctioned the raising of nine more India Reserve Battalions comprising 9,000 police personnel for Naxalite-affected states, including Haryana. While Andhra Pradesh, Jharkhand, Orissa, Karnataka, Uttaranchal, Uttar Pradesh and Haryana can now raise one IRB each, Chhattisgarh can raise two battalions. In the wake of spurt in Naxalite attacks on railway property and passengers, Union Home Minister Shivraj Patil today held a high-level meeting to device strategy to pre-empt such attacks in the future. The Nitish Kumar government in Bihar opposed the bail petition filed by Ranvir Sena Chief Barmeshwar Singh, alias Mukhiaji, on the ground that he was accused in a large number of criminal cases, which included those related to massacres. The Patna High Court today dismissed the bail petition of RJD MP Rajesh Ranjan alias Pappu Yadav in connection with the murder of CPM legislator from Purnia, Ajit Sarkar. Navy has placed an order with Bharat Dynamics Limited (BDL) for 25 anti-submarine torpedoes developed by National Science Technological Laboratory (NSTL), Visakhapatnam. The Nitish Kumar government has earned kudos from Unicef for undertaking an effective immunisation and polio eradication drive resulting in the drop of polio cases from 29 in last year to just seven cases till March this year. The Information and Broadcastimg Ministry has made top-level changes in two media units and appointed a new Director-General (News) in the News Service Division of the All-India Radio. The Bureau of Indian Standards conducted 30 raids on firms misusing ISI mark in Haryana, Delhi and Rajasthan. During these raids, various household products were detected to have misused ISI mark. The construction work on two important stretches of the National Highway No. 1, which was held up since long due to non-performance of contractors, has re-started and is likely to be completed by the end of next year. With the condition of senior BJP leader Pramod Mahajan continuing to be critical, a Muslim man from Bihar has offered to donate his kidney to him. BJP leader Pramod Mahajan continues to be ‘critical but stable’, according to a bulletin put out by the Hinduja Hospital, where he is recuperating. Uttar Pradesh Governor T.V. Rajeswar has written a letter to Chief Minister Mulayam Singh Yadav asking him to recommend a CBI probe into the Mehar Bhargava murder case. Danish Parkar, nephew of Dawood Ibrahim, on the run from the Mumbai Police died in a road accident in Raigad district adjoining Mumbai, on Wednesday night. Journalist approaches court to end his life. Leaves are the canvas for this painter. Taj Mahal to build peace bridges with Pakistan. According to a report released by international agency Oxfam today, “following the failure of the WTO members to make significant progress this week in Geneva, especially the disagreement between the EU and the US, the development concerns have been sidelined. Unless offers change significantly in the next three months, poor countries would be better off continuing to negotiate rather than signing a deal this year,” it warned. Mr Palash Kanti Das, South Asia Regional Trade Policy Adviser, Oxfam, said during his recent visit to India, WTO chief Pascal Lamy’s tried to press upon Indian government and industry representatives that to gain on the industrial and service front developing countries may have to compromise on agricultural tariffs. Subsequently, farmer organisations are apprehensive whether “government would a make a compromise on the livelihood, rural development and food security issue” under the pressure of industrial and trade lobbies, he said. While a new deal is badly needed, current offers are not good enough and poor countries would be better off missing the 2006 deadline and holding out for better offers, stated the Oxfam report ‘A recipe for disaster’. The developing countries are putting pressure on the developed countries saying that once the term of the fast-track Trade Protection Authority expires in June 2007, new deal could take years to agree. Experts warn that reforms agreed in Hong Kong as part of a so-called ‘development package’ are not sufficient to cancel out the damage in other areas. Export subsidies will be stopped in 2013 but they only represent 3.6 per cent of the EU spending on agriculture and should have been eliminated earlier. Duty and quota-free market access for the poorest countries is too restricted and ‘aid-for-trade’ offers are largely made up of recycled pledges. “The Heads of State meeting proposed by the UK and Brazil, could give then needed boost to get a deal this year, but only if they insist on putting development first,” he added. Oxfam’s report shows that the combination of disappointing offers on agriculture, and aggressive demands on industrial liberalisation and services, could make many developing countries worse off. By limiting the flexibility necessary for countries to use trade policy as a tool for development, the new WTO deal could destroy livelihoods, prevent industrialisation and lock people into poverty. Poor countries also need adequate aid for trade that is not linked to market opening, patent laws that ensure access to affordable medicines, and action to address preference erosion, the report added. There was no incident of booth capturing, no physical presence of any cadres near polling stations, no escorting of voters, which was a new scenario for a Bengal election. The elections that were held today for 76 of the total 77 constituencies in Kolkata and North 24-parganas and South 24-parganas, were brisk, smooth and peaceful, though at some places, polling was slow because of double checking of voter's identity. Till 4 pm, average polling had been up to 55 per cent but it later crossed 80 per cent. In the past two phases of elections in Purulia, Bankura, west Midnapore, Howrah, Hooghly, east Midnapore and Nadia, the average percentage of polling was 85%. Polling was counter-countermanded today at Bhatpara in north 24-parganas following sudden death of the BJP candidate there. The state electoral officer, Mr Debasish Sen, and the deputy election commissioner, Mr Anand Kumar, claimed elections had been free, fair and peaceful. Mr Sen said polling was hampered in four places in the city and South 24-parganas because of a technical fault in the EVMs, which was soon rectified. Mr Kumar spent most of the time in the Belgachia east constituency, where the disputed CPM minister Subhas Chakraborty was locked in ballot battle with his one-time lieutenant, Sujit Bose, now a TMC candidate. In the 2001 Assembly elections, the Trinamool Congress had been a dominating force in north 24-parganas and Kolkata, while the CPM and Left parties had retained their supremacy in South 24-parganas. However, in the 2004 Lok Sabha poll, the ruling Left Front re-captured its control in the two 24-parganas districts and Kolkata. After the withdrawal of four candidates, 16 candidates now remain in the election battle in the high-profile Rae Bareli parliamentary byelection scheduled for May 8. The four Independent candidates who withdrew their nominations are — Mohd Najim of Inquilab Party of India, Surendra Kumar, Hori Lal and Vasudev. A total of 24 candidates had filed nominations. The District Magistrate, ex-officio Returning Officer, Mr Jitendra Kumar, had rejected the nominations of four Independents candidates — Mr Ashok Pandey, Mr Bharat, Mr Sanjay Kumar and Mr Manish Chandra Sharma during scrutiny of papers on April 21. Apart from Congress president Sonia Gandhi, the only other senior leader in the fray is BJP general secretary Vinay Katiyar. The BSP has chosen not to contest in favour of Sonia Gandhi. The Samajwadi Party has fielded a absolute greenhorn — Mr Rajkumar Chowdhary. The BJP leader and former Madhya Pradesh Chief Minister, Ms Uma Bharti, has put her weight behind the Apna Dal candidate Prabha Singh Lodh. The Rashtrawadi Janata Party (RJP) has fielded Deepa. The Rae Bareli byelection was necessitated after the Congress chief resigned from her Lok Sabha seat following the office-of-profit controversy. Answering a question while launching his mother Sonia Gandhi’s election campaign, Rahul Gandhi sent a wave of delight through the rank and files of the Congress party when he for the first time articulated what they had been eagerly waiting to hear for months. “Now if Rahul takes over a credible alternative to the Samajwadi Party in the state would have been found” said. UP Congress Legislative Party leader Pramod Tiwari joining Khurshid in welcoming Rahul’s possible taking over the party leadership in the state. Seeming completely in command of the campaign, Rahul set the tone by reiterating the family’s old ties with Rae Bareli. “My family has an old relationship with Rae Bareli. My ‘dadi’ contested from here. And now my ‘mata ji’ is in the fray,” he said. Keeping the focus sharply on issues of development, Amethi MP lashed out at the state government for ignoring his pleas for better access to electricity and water. “What is the point of complaining? With the help of the government in Delhi we are doing what we can do”. The Bihar unit urged the party president, Ms Sonia Gandhi, to give necessary go-ahead to Mr Rahul Gandhi without any further delay. A senior Congress leader and party spokesman, Mr Prem Chandra Mishra, while talking to The Tribune, claimed that it could be a turning point for the party in Hindi heartland to retrieve its lost grounds, if Ms Gandhi allowed her son to go ahead, leading the party to end the alleged misrule of Samajwadi Party in Uttar Pradesh. Going a step forward, even before the Congress high command endorsed Mr Rahul Gandhi’s views, Mr Mishra demanded that the young MP from Amethi, besides UP, should also be allowed to lead the party in Bihar. “This will help us to stage a comeback in 2008 Lok Sabha and 2009 Assembly polls”, he said. In his reply to the letter sent by Leader of the Lok Sabha and Defence Minister Pranab Mukherjee on April 3, senior BJP leader and Leader of Opposition in the Rajya Sabha Jaswant Singh said it would be difficult to suggest any specific inputs unless the government shared with it its thinking on the subject. Mr Jaswant Singh said he would be disinclined to dilute what he considered to be the moral and public obligation of propriety, enjoined upon all elected representatives and all holders of public office. Mr Mukherjee, in his letter, had sought Mr Jaswant Singh’s views, among other things, on whether amendments to the Act would suffice or a new comprehensive legislation was required. Releasing the letter of Mr Jaswant Singh to the press, BJP spokesperson Ravi Shankar Prasad said, “The conspicuous silence of Prime Minister Manmohan Singh on such a vital issue is intriguing”. He said the controversy over the office of profit had arisen by accident under pressure of competitive politics and taken its toll on Congress President Sonia Gandhi, who sought to make a virtue out of a compelling necessity. Mr Prasad said, “This provides an occasion to rise above petty considerations and reinstate the larger moral resolve to strengthen our democratic polity”. He added that while considering any amendment dealing with the issue of office of profit, no attempt need be made to reverse this process. BJP has retained the Patna West Assembly seat for which the byelection was held on Monday. BJP’s candidate Nitin Navin, supported by JD(U), won by a margin of over 70,000 votes, defeating Congress candidate Ajay Kumar Singh who was backed by the RJD and CPM. There were 13 candidates in the fray but the main contest was between the BJP and the Congress. Despite the abysmally low polling on Monday with just a little over 1 lakh voters of a total of 5.5 lakh having exercised their franchise, the BJP bagged over 80 per cent of the votes polled to retain the seat. Talking to the Tribune, senior BJP leader and MLC Kiran Ghai said that the massive victory only confirmed the growing faith of the people in the ruling NDA in Bihar. State JD(U) general secretary Venkatesh Kumar claimed the victory was an endorsement of the support of the people to the Chief Minister. Alleging that the findings of the commission headed by Justice Thomas P. Joseph “exposed the communal politics” played by both LDF and UDF, party spokesman Prakash Javadekar told newspersons here that the report submitted by the commission in late February 2006 was gathering dust in the Kerala Secretariat. “This act of hiding the report is a joint mission of the UDF and the LDF to appease a particular vote bank”, he said. Mr Javadekar claimed that the commission had found that the Marad massacre was a planned conspiracy involving extremist organisations, which were funded from abroad. Alleging that the real reason for not making public the findings of the commission were “purely political”, the BJP spokesman alleged that the NDF, an outfit allegedly having links with the ISI was supporting tacitly the UDF while the PDP-led by Madani and Jamait-e-Islam were directly supporting the LDF. Prime Minister Manmohan Singh has waded into a maze of controversies on return from his foreign trip. Faced with rising anger against Human Resource Development (HRD) Minister Arjun Singh’s proposal to provide quota for OBCs in Central universities and IITs and IIMs, the Prime Minister has also to contend with his ministerial colleagues openly differing on the issue. Science and Technology Minister Kapil Sibal has gone public with opposition to the HRD Minister’s proposal. Congress spokesperson Abhishek Singhvi has refused to comment, saying he does not know the context in which these remarks have been made. Even as the government is struggling to articulate its position on this matter, the Volcker controversy has returned to haunt the Congress. Having kept a low profile since his resignation, the former minister named as a beneficiary of Iraq’s oil-for-food programme today went on record to suggest that while he was being deliberately targeted, there was no reference to the Congress, which had also been named a beneficiary. Just two days ago, Mr K. Natwar Singh sought to embarrass the government in general and the Prime Minister in particular by publicly attacking the Nepal policy. The HRD Minister’s proposal on quota has become a political hot potato. Given the increasing electoral clout of OBCs, no party, including the Congress, can openly oppose the move. The Congress is in a bind on the issue as it stands to lose the support of upper castes and middle classes if it comes out in favour of this proposal. Mr Sibal’s open opposition has added to the discomfiture of the Prime Minister on the issue. While many Congress leaders support Mr Sibal privately, they have been questioning Mr Arjun Singh’s motives. There is a view that Mr Arjun Singh has been raking up issues which will make him more acceptable to UPA allies and the general rank and file of the Congress, which may be disenchanted with the present dispensation. There is an overwhelming view that the HRD Minister is either eyeing the prime ministerial post or positioning himself as the next presidential candidate. While Mr Arjun Singh’s political gameplan is a matter of speculation, Mr K. Natwar Singh’s attempts to drag the party into the Volcker controversy is a matter of concern. Although Congress President Sonia Gandhi has been quick to distance herself and the party from the controversy, there is a worry that the former minister will step up his effforts to implicate the Congress if he finds the noose tightening around him. The Congress has refused to be dragged into the controversy, with Mr Singhvi stating that there is no point speaking on these issues through the media. If anybody has anything to say on these issues, they should say so to the CBI or the Pathak and Dayal committees, he has added. As the revived Parliament of Nepal meets tomorrow, CPM leader Sitaram Yechury, who has been mediating between the seven party alliance (SPA) and Maoists, would visit the Himalayan Kingdom as part of his efforts towards finding a way to usher in democracy. "A four-point roadmap has already been agreed upon by the SPA and the Maoists as the way out of the impasse. Now, we are looking forward towards realisation of those objectives," he told reporters here. The revived Parliament of Nepal meets tomorrow and all eyes would be on the Prime Minister Girja Prasad Koirala and the steps he takes to implement the 12-point agreement reached with the Maoists in November. ''We are lifting the blockade of Kathmandu and other places till Friday, when the revived Parliament holds its first sitting,'' a statement issued by the Maoist leader Prachanda said. It would be the priority of the new government to go for elections to the Constituent Assembly, implement the 12-point agreement with Maoists and officially inviting them for talks. Yechury, who won the praise of Prime Minister Manmohan Singh for his effective role in defusing the crisis in the neighbouring country, said the Maoists joining the mainstream in Nepal will have a salutary effect in the naxal movement in India. The CPM Rajya Sabha member, who has held extensive discussions on the situation in Nepal with Defence Minister Pranab Mukherjee and a Group of Ministers of the government, said the new Nepalese government has a four-point agenda on its hands. The four points are the New Parliament deciding elections to the Constituent Assembly, agenda to implement the 12 point agreement with the Maoists, interim government officially inviting Maoists for discussions and Parliament taking legislative steps to undo the laws adopted by the King during the past one year, he said. Asked whether he would be visiting Nepal at the invitation of the new government, Mr Yechury, a Rajya Sabha member, said he is neither visiting that country at the invitation of the government nor as a representative of the Indian government. "It is a matter of joy and satisfaction that the prolonged movement has achieved victory, though there are many roadblocks still to be over come," he said. As the Nepal crisis appears to be doused, the ethnic strife in Sri Lanka seems to have flared up which causing concern to New Delhi. The CPM today asked the government to send a clear message to the LTTE that it was against acts that end the cease-fire and derail the peace process. The CPM Politbureau said in a statement that the Lankan government must deal with the situation with restraint and patience so that it does not get further complicated. Despite its formal denial, the terrorist attack on the army headquarters that killed 10 people and injured the army chief had all the hallmarks of a LTTE operation, the party said. The Centre today sanctioned the raising of nine more India Reserve Battalions (IRB) comprising 9,000 police personnel for Naxalite-affected states, including Haryana. While Andhra Pradesh, Jharkhand, Orissa, Karnataka, Uttaranchal, Uttar Pradesh and Haryana can now raise one IRB each, Chhattisgarh can raise two battalions. It is also considering sanctioning one IRB each for Tamil Nadu and West Bengal, which are also affected by the menace. In addition to these, the government has given its nod for raising five IRBs for Jammu and Kashmir and six for the northeastern states of Arunachal Pradesh, Assam, Meghalaya, Mizoram, Nagaland and Tripura, where insurgency prevails. “The Centre has been assisting the Naxalite-affected states to enable them to deal with the problem. The sanction to raise the additional battalions is also part of the exercise to wean away unemployed youth from being attracted to alternative sources of livelihood offered by Naxal elements,” a Home Ministry press note said. The battalions sanctioned for the eight states facing Naxal problem is under a new scheme that will ensure higher central financial support of over Rs 20 crore per battalion towards the cost of raising and infrastructure assistance as compared to Rs 13 crore earlier. The previous scheme had 50 per cent loan component. It said the Naxalite-hit states had also been asked to progressively reduce their dependence on central paramilitary forces by raising the IRBs. These states had also been asked to arrange specialised commando-type of training to the new IRBs, whose personnel were recruited locally and were better suited to tackle the extremist problem as they knew the demography, customs and traditions, ethos and culture of the area. The Centre had also offered support in training of these battalions by the paramilitary forces and the Army, it said. The battalions sanctioned for Jammu and Kashmir and the Northeastern states would be totally funded by the Centre as per the scheme. Among others Union Home Secretary V.K. Duggal, Railway Board Chairperson Joginder P Batra, and Director-Generals of Railway Protection Force and the CISF attended the meeting. The meeting took place a day after Naxalites carried out a daring attack in Narganjo railway station on the Jhajha-Asansol Railway line in Bihar last night. More than 100 armed Naxals attacked the station and blew up a railway cabin. This was the second Naxal attack on railway services in less than 20 days. On April 9, the Naxalites blew up a railway station and a track in Gaya district. In the recent past, the Home Ministry had been concerned over the spurt in attacks on railway property. This was contrary to the allegations levelled against the government by the Opposition RJD for patronising The Ranvir Sena. Barmeshwar Singh has applied for a bail before the Patna High Court. The alleged nexus between the ruling NDA and the Ranvir Sena surfaced recently, when the Nitish Kumar government decided not to review the decision made by the former Governor Buta Singh. It ruled out any further extension to Justice Amir Das Commission after its term expired in the first week of April. The Amir Das Commission, constituted by the previous RJD government in 1997, was probing the political links behind the Ranvir Sena in the backdrop of the Laxmanpur-Bathe massacre of 1997, where 59 Dalits were killed by its activists. The commission had failed to submit any report despite being given eight extensions to its tenure in the past nine years. On its part, The Patna High Court directed Barmeshwar Singh , the founder of the banned Ranvir Sena, to file an affidavit and give details of criminal cases that was pending against him.Details were also asked of the cases in which he had been granted bail. The case came up for hearing in the court of Justice Aftab Alam. The state government counsel Dwivedi Surendra opposed the bail. Sources claimed that by opposing the bail petition of the Ranvir Sena chief, the government tried to send out a message that it was equally firm in its attitude in handling the Maoists and the Ranvir Sena. The Ranvir Sena chief was presently lodged in Beur jail. The court dismissed the petition of Yadav on the ground that there was no basis to grant him bail and observed that he would have to stay in judicial custody for at least six more months. Mr Yadav, who represents the Madhepura Lok Sabha constituency, filed the bail petition after the Supreme Court directed him to approach the high court for bail in the case. Mr Yadav is currently lodged in the high security Tihar Jail in New Delhi. He was shifted from Beur Jail in Patna to Tihar Jail on the orders of the court last year before the state Assembly polls in Bihar. The verdict by the Patna High Court comes at a time when the Supreme Court in response to a PIL by Deputy Chief Minister of Bihar Sushil Modi and state JD(U) president Rajiv Ranjan Singh on Monday suggested a change of the judge in the special court of the CBI to hear into the disproportionate assets case against Mr Lalu Prasad and Ms Rabri Devi. Mr Prasad opposed the move through his lawyer Ram Jethmalani. To add to Mr Lalu Prasad’s troubles, the Vigilance Bureau in Patna again alerted the Police Commissioner of Delhi, DGPs of all states and the airports on Tuesday regarding the non-bailable arrest warrant issued against his brother-in-law Sadhu Yadav in connection with the multi-crore flood relief scam. It may be noted that the alleged murder of Ajit Sarker by Pappu Yadav, despite the CPM being an ally of RJD in Bihar, had strained relations between the two. Only seven other countries in the world have the technology to make these torpedoes, Dr V. Bhujanga Rao, Director, NSTL, told reporters here yesterday. Hyderabad-based BDL has already made five of these lightweight torpedoes with the technology provided by NSTL, and the Navy is satisfied with their performance. Dr Rao disclosed that lightweight torpedoes will be inducted into the Navy in the next two years. NSTL, the only lab in the country working on the development of under-water weapons like torpedoes, mines, and design for hydrodynamic parameters of warship and submerged vehicles, was established in 1969 under the Defence Research and Development Organisation (DRDO). Dr Rao said significant progress was made in the development of heavy-weight torpedoes and the scientists at NSTL established complete capability for building them. These torpedoes, weighing 1500-2000 kg and 6-8 metre long, were likely to be deployed by 2009-2010, he said. The NSTL has also frozen the design for autonomous underwater submersible, which can work up till 500 metre depth. Submersible, which will play important role in future, is used to deploy weapons and help in salvaging operations. This smaller and versatile version of submarine is also used in civilian areas such as tourism. The Director said the lab had also developed a number of stealth technologies in the fields of vibration, acoustics, radar signal suppression and infra-red and was working to engineer the technology into stealth warships being built by Navy. NSTL is working on the most modern mines which can detect the target from long ranges using advanced technologies in the filed of sensors, structures, controls etc. Dr Rao said NSTL’s state of the art facilities include those for checking stealth features, which are not available in this part of the world. The state Health Minister, Mr Chandramohan Rai, told the media that Unicef expressed satisfaction over the pro-active measures by the ruling NDA to eradicate polio from Bihar. Going by the Unicef findings, Bihar and Uttar Pradesh together accounted for the maximum number of polio cases in the recent past compared to the rest of the country. It was learnt that country head of Unicef Cecileo Adorana, who met Chief Minister Nitish Kumar yesterday, also discussed the modalities to further strengthening of the awareness campaign to remove the misgivings among the minority community in the state, which was reportedly conservative in its approach in administering polio drops to their children because of some superstitions. The minority community in general, which recorded the maximum number of polio cases in the past, was under the false notion that polio drops could decrease the fertility and growth of their children”, a senior health official said. Sources said Unicef proposed to jointly organise camps with the state government involving Muslim clerics to motivate the minority community to take their children to the nearest centres in large numbers to administer polio drops in future. According to Unicef, the immunisation drive, which covered 11 per cent of the population in Bihar last year, has shown a marked increase at 25 per cent in the first four months of the present year. According to an order issued by the ministry on Tuesday, Mr Swagata Ghosh, the Director, Directorate of Audio Visual Publicity (DAVP) will now be posted as Director-General, DAVP. The Director, Publications Division, U.K. Mishra has been posted as the Director-General (News), News Service Division, AIR in place of Principal Information Officer Deepak Sandhu who was holding additional charge for the past nine months. At the same time, Mr D. Mukhopadhyay, Director in the Directorate of Field Publicity has been appointed the Director-General, DFP. Further, Veena Jain, a Senior Administrative Grade Officer (SAG) of IIS Group `A’ has been posted as the Director, Publications Division in place of U.K. Mishra. Ms Jain was awaiting posting on reporting to the Cadre following completion of her training in the Indian Institute of Public Administration (IIPA) early this month. According to the order, all SAG officers of IIS Group ‘A’ have been appointed by the President to the selection grade with effect from the date they assume charge of the new post. The Bureau of Indian Standards (BIS) conducted 30 raids on firms misusing ISI mark in Haryana, Delhi and Rajasthan. During these raids, various household products were detected to have misused ISI mark. According to Mr Anant Dhul, Chief Vigilance Officer, BIS, by using such type of spurious household products, the safety and health of consumer is at risk. He added that to save the consumers from this risk and to protect the brand value of ISI mark, the BIS has intensified regular nationwide raids. Five raids were conducted in Haryana at M/s All Space Polymers (P) Ltd., Faridabad, which was misusing ISI mark on packaged drinking water, M/s Alpine Enterprises, Faridabad for misusing ISI mark on naphtalene balls under brand name “Sparsh”, M/s Mehta Wood Products, Yamunanagar, for misusing ISI mark on plywood, blockboard. Raids were also conducted at M/s Empire Plywood Industry, Yamunanagar, which was misusing ISI mark on plyboard and blockboard under brand name “Fero” and “Kenwood”and M/s Jawala Plywood Industries, Yamunanagar, which was misusing ISI mark on plywood under brand name “Swastik” and “Assam Queen”. Six raids were conducted in Delhi and three raids were also conducted in Jaipur. Besides these, three raids were conducted in Madhya Pradesh, six in Gujarat, two in Karnataka, three in Kerala, and one each in Bihar and West Bengal. The work on two sections near the Delhi border — the six-laning of the 21.7-km segment between Panchi Gujran to Kamaspur in Sonepat district and the eight-laning of the 12.9-km stretch between the Delhi border and Mukarga Chowk, was stalled after a breach of contract by the respective contractors. This resulted in the two stretches ending up in a bad shape, causing a lot of inconvenience to traffic and the local population. The contracts for the two stretches were re-awarded recently and the work on the two segments is now going on. Besides, the National Highway Authority of India (NHAI) is also on the verge of awarding the contract for six-laning of the 20-km road between Panchi Gujran and Panipat. The detailed project report (DPR) for the stretch is ready and the contract is likely to be awarded soon. The offer from Naushad Haider, a 40-year-old member of the BJP’s Minority Morcha, came close on the heels of a large number of Muslims offering prayers at the BJP headquarter in Delhi yesterday for the speedy recovery of Mr Mahajan. Mr Haider said he did not care for his life but wanted to save the life of Mr Mahajan, whom he considered as a secular leader in the BJP. Mr Haider said he had already written a letter to BJP president Rajnath Singh expressing his desire. He added that the dosage of drugs being administered to Mahajan is coming down. He continues to be on ventilator support and is on dialysis following kidney failure. According to doctors, Mahajan’s other vital parameters remain the same and a team of experts are monitoring him round-the-clock. Responding to the police’s inability to nab the prime suspect Sachin Pahari, despite a month having lapsed since the death of Mehar Bhargava, the governor in his letter has referred to the various memoranda submitted to him by different political parties demanding a CBI inquiry into the killing. Among those who had met the governor to put pressure on the government included former Prime Minister Atal Bihari Vajpayee and former Chief Minister Mayawati. Congress leaders Ashok Gehlot, Pramod Tewari and Salman Khurshid also demanded a CBI probe into the killing of Ms Bhargava, wife of Congress leader Luv Bhargava. The car in which Parkar and his associates were traveling collided with a truck on the Mumbai-Goa Highway killing him and another person, the police said. Though Parkar had several small cases against him, the cops began a hunt for him only this month after he cut off the tongue of a victim following a failed extortion attempt. According to the police, Danish was trying to set himself up as a gangster in the Byculla area, where Dawood Ibrahim first set up base.